This time last year we were making several trips to out of state flea markets. With the price of gas so high, we can long longer do this. In spite of this we still manage to put on quite a few miles going to local estate and yard sales. Until this weekend I haven't really hadn't found any real treasures. 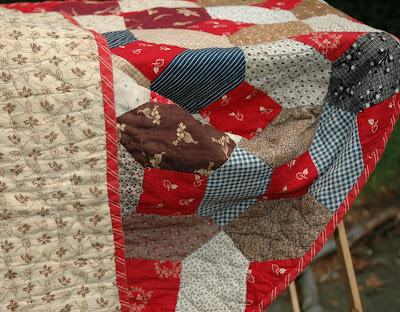 On Saturday, I found this wonderful little crib quilt at a local antique sale. (Gracie must of course approve anything that comes into the house)! I love the cranberry reds. The prints are actually all different, but so carefully selected that they match perfectly! It also has indigo prints, black mourning prints, beautiful old browns, and lovely shirting prints! The backing is a white and brown shirting print. It dates from the 1890's to 1910's. What is really remarkable is that even the binding was made from one of the cranberry prints, and it is intact, in excellent condition! That almost never happens! I also picked up two other quilts with lots of indigo and mourning cloth prints, but they are definitely "fixer-uppers". The real prize was the crib quilt! The only bad part of the day was when I fell on a pile of plastic bags that someone left out. Kaboom! I went down hard! Landed on my wrist. Luckily nothing is broken but oh boy does it ache! 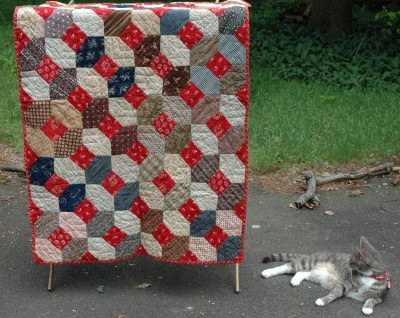 Oh well, the quilt was worth it! 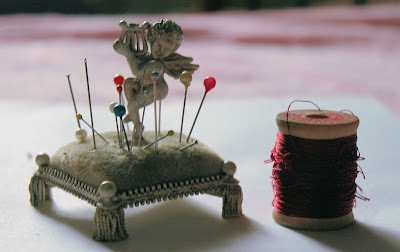 At another garage sale I found this little Victorian angel pin cushion. 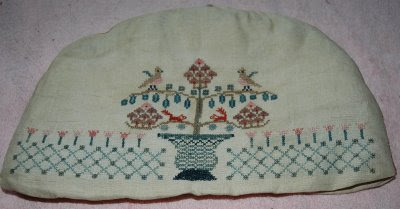 And, at another sale, I picked up an antique tea cosy. There is a different cross stitch design on each side. I love the little red squirrels! All in all, not a bad week-end! I am so pleased! Normally all I ever see at these sales are those dreadful bright colored plastic toys that everyone is trying to get rid of! I love the finds, Erica! 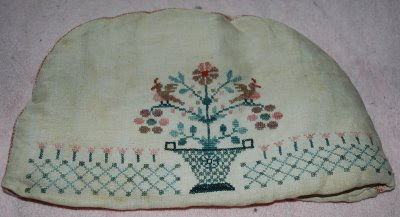 I can never find anything that is stitching/fabric/sewing related at the flea markets/tag sales/etc around here, ugh! It was really unusual for me! Normally I can spot those bright yellow and pink toys a mile away! Thanks for stopping by my blog :-) Your Chase Sampler is amazing! You got some really nice things in your shopping. Love that crib quilt. Very nicely done. I love your yard sale finds! They are treasures!! Isn't it great to rescue these lovely things before they can tossed in a garbage pile. WOOT : ) wonderful finds!